The Dunlop MSA British Touring Car Championship returns to the track this weekend after its summer break, with crowds expected to flock to Snetterton in Norfolk for one of the fastest races of the season. Eagle-eyed fans will also spot a slight change to the racing cars’ liveries, with Chevrolet’s new 5-Year Promise Logo clearly displayed on Jason Plato’s and Alex MacDowall’s Cruzes. 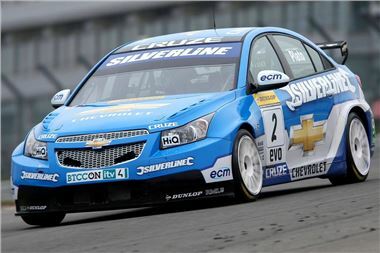 But if you can’t wait that long, Chevrolet and Silverline Tools have teamed up to give you first-hand experience of BTCC racing via an online game, hosted on the official www.chevroletbtcc.co.uk website, where there are some great prizes to be won. The game allows you to drive either Jason’s or Alex’s Silverline Chevrolet Cruze on a tricky circuit, with the best overall times recorded before August 16th set to win a series of fantastic prizes. The fastest overall time will see one lucky winner getting an exclusive track day with either Jason Plato or Alex MacDowall, as well as VIP hospitality at the final race of the season at Brands Hatch on October 10. Two runners-up will receive Silverline tool kits worth £250, ten further lucky winners will receive VIP factory Tours of RML – the home of the Silverline Chevrolet Racing Team, where the cars are prepared, and a further 20 runners-up will receive Chevrolet Racing merchandise and clothing. To be in with a chance of winning, budding racers need to visit www.chevroletbtcc.co.uk and click on the link at the top of the page, which takes them straight to the race track. Winners will be contacted via email after August 16.